There's organic gardening, and then there are gardens that evolve organically. Folks have been wondering what's going on next to the parking lot of Herrontown Woods. A clearing has been created, first by storms in recent years that blew down most of the pine trees planted long ago. Then two years ago a crew hired by Princeton to knock out early infestations of invasive species came through to treat the thorn-cloaked Japanese aralias that were thriving in the absence of the pines. Volunteers with the Friends of Herrontown Woods have since followed up by removing the thickets of honeysuckle vines, privet, and other nonnative invasives that were filling the void. After some general cleanup, what remains is the most unlikely of opportunities in Princeton's densely forested nature preserves: a clearing where the many native grasses and summer-blooming wildflowers can thrive. Our dream for this clearing has evolved into a botanical garden where people can get acquainted with the native plants of Princeton. When I moved from Michigan down to Durham, NC back in the 90's, I learned the southern flora by visiting the NC Botanical Gardens and the Blomquist Garden at Duke, where the many native species were labeled. Ours is envisioned as a low-budget version for Princeton. Seeking to stay ahead of the default weedy species poised to claim this clearing, we undertook on Earthday this past Sunday to pull out the ubiquitous Japanese honeysuckle. When dealing with an acre of land--about the size of a football field--it helped to notice that the trunks of fallen trees, left in place to tell the story of storm damage, have divided up the land into informal compartments that can be weeded and planted one at a time. That's Perry, participating in our divide and conquer strategy. Some other weeds being pulled out before they can go to seed are hairy bittercress, garlic mustard, and dandelions. A little work now will make maintenance much easier later on. Kurt does much of the restoration of trails and habitat at Herrontown Woods, and here is planting a hazelnut. One of the compartments features native grasses and sedges, like fringed sedge and bottlebrush grass. They look bedraggled in their early spring mix of new and old growth, but once established, these will grow into a graceful mound with interestingly shaped seedheads at the top. It would be nice to have a pretty flower to show right now, but so much of gardening involves looking beyond what is to what will be. 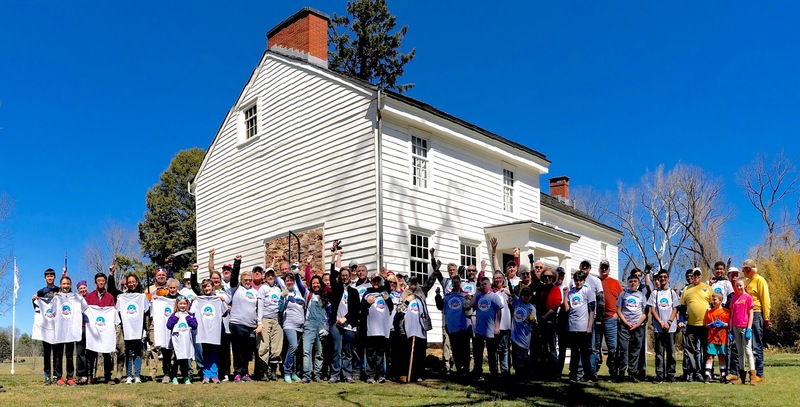 Each year, the Princeton Battlefield Society teams up with the local Sierra Club to host a spring cleanup day at the Battlefield. My role the past couple years has been to lead some of the volunteers on work to clear vines and brush around some dogwood trees planted in 1976--the year of the nation's bicentennial. They line the edge of the lawn on the north (column) side of Mercer Street. As with any planting, some followup is necessary, and the state limits its maintenance to lawn mowing. Many of the dogwoods have had to withstand the smothering embrace of aggressive vines like porcelainberry, and bombardments of branches as towering pines lose their lower limbs in snow storms, making our yearly interventions feel like a rescue operation. The cleanup days always begin with a group photo in front of the Clark House that adds a wonderful sense of place to all the open space around it. This year, while assembling for the shot, we momentarily lost focus when someone spotted a red-tailed hawk flying to a nearby tree, carrying a small snake. Nature and culture in close proximity--that's one of the charms of Princeton, though the snake might disagree. It was the first nice spring day of the season, which added to our spirited work of lopping, sawing and dragging. There were a lot of good trees to rescue from the vines: cherries, oaks, and of course the bicentennial dogwoods. A lot of learning happens at these workdays, as volunteers become familiar with some of the plants being saved or removed. Here are the flower buds of the flowering dogwoods, still dormant but poised to open. Their blooms in turn will form nutritional berries for migrating birds in the fall. Hopefully the state crews will chip up the brushpiles we made. This boy was very proud of having opened up a pathway that had been blocked by a young tree bent low by a burden of aggressive vines. An invasive shrub (Honeysuckle) was smothered in invasive vines (porcelainberry). The easiest way to extract it was by cutting it at the base and "rolling" it out of the sea of vines. Clearing the field's edge of brush uncovered some daffodils that had been planted long ago. We left the wineberries and blackberries in hopes of a crop during the summer. We finished the afternoon encouraged, by progress that built on last year's progress, by each other's good company, and by the feeling of participation in caring for hallowed ground. Here's our merry crew. It sure is pretty, but beware. It will take over your garden and your lawn. Too much of a good thing--it's the dominant story of our time, whether it be carbon dioxide in the air or a pretty wildflower spreading along the curb. Lesser celandine (Ficaria verna), also called fig buttercup so as not to confuse it with the native celandine poppy, has essentially paved whole valleys. It's poisonous, and no wildlife have adapted to eat it, giving it a big competitive advantage. The most dramatic local examples are in Pettornello Gardens over at Community Park North, and downstream areas in Mountain Lakes. I've been watching it spread into the neighborhood one block from my house. Homeowners think it pretty at first, then feel distress at its aggressiveness. Best to knock it out when it first arrives, with 2% glyphosate (wetland-safe formulation recommended when close to streams and wetlands). Digging it out is fraught with risks, as it spreads via small underground tubers, and probably via seeds as well. Visiting my former home in Durham, NC, some years back, where it has only recently appeared, I found it growing in a couple adjacent yards, poised to spread via runoff into the local watershed. We asked the homeowners for permission to knock out the infestation. One neighbor agreed, while the other refused, indifferent to the impact her infestation would have when it inevitably spread beyond the boundaries of her yard. I had tracked another infestation elsewhere in Durham back to a homeowner's yard. He was grateful to find out what the plant was, and promptly eliminated it, as well as some he had given to his daughter in yet another watershed, thinking it was pretty. These sorts of experiences put the lie to allegations that invasive plants are already so numerous that it's not worth trying to stop their spread. On the contrary, these plants' negative impact can be greatly reduced at the local level through timely action. This time of year, you can tell with one glance how many non-native shrubs are growing in a local woodland. Non-natives like privet, winged euonymus, and bush honeysuckle leaf out earlier than most native shrubs, reflective of their having evolved in a different climate from our own. Many of our woodlands are now thick with these non-native shrubs, and their early leafing out has ecological consequences. The spring ephemeral wildflowers have evolved to utilize the sunlight available during that window of time in spring when the woody plants above them are still dormant. Introduce woody plants that leaf out earlier, and the wildflowers can't store up enough energy to bloom the next year. This problem will be exacerbated as we lose the many ash trees in our woodlands, since the nonnative shrubs will likely grow all the more densely as more sunlight reaches the understory in summertime. At Herrontown Woods, we're cutting down the non-native invasive shrubs, to allow more sunlight to reach spring wildflowers, and also to allow native shrubs a chance to thrive. Why Do My Nursery-Bought Rhododendrons Languish? My wife loves things that are beautiful and special, and Rhododendrons are one of them. So periodically we buy one at a local nursery and plant it in the yard, and each time the Rhododendron languishes and ultimately gets pulled out. What's going on? Soil not acid enough? Poor drainage? Meanwhile, the rhododendron that came with the house thrives under a red oak near the driveway. This past summer, a developer allowed me to dig up some plants from the foundation of a house he was going to demolish. One was a Rhododendron, which came home with the small knot of roots I managed to dig up. Having transplanted it while it was in bloom, I had no expectations that it would survive, and yet it survived the summer, and now has survived the winter far better than a nursery-bought Rhododendron we planted around the same time. Might the Rhododendrons available in local nurseries be bred to look good in pots rather than prosper in a typical garden? That's the working hypothesis here, that the sorts of Rhododendrons bought and planted in the 1960s may have been better adapted for gardens, but don't look as good in pots at the nursery, and so couldn't compete with whatever fragile varieties are commonly sold now. The New Yorker published a letter of mine, responding to their beautiful article by Jill Lepore on Rachel Carson's writings about the sea (A Critic at Large, March 26th). Those books written earlier in Carson's career were largely forgotten after her earth-shaking Silent Spring came out in 1962, but they were some of the first books on the environment I read. My environmental awakening came during a quarter-long environmental field trip to Georgia and Florida during my second (and last) year at Antioch College. The trip included two weeks at a research station on Ossabaw Island, off the coast of Savannah, Georgia. There I read Carson's descriptions of Spartina salt marsh grasses, swatted mosquitoes while learning to improvise melodies on clarinet, and discovered in my self-directed ramblings and research the elegant adaptations pine tree species have evolved to periodic fire. The discovery began with an observation and a question: Why are the pine forests burying themselves in a deep mulch of pine needles, through which no new tree could possibly sprout? The answer, that the trees had co-evolved with fire to such an extent that they could no longer thrive without it, revealed in the woods around our cabins an unexpected depth and elegance in nature that I surely was encountering in Rachel Carson's writings at the same time. Jill Lepore's The Shorebird, about Rachel Carson, sent me into a deep inner stew for a day, ending as it did with a "what if". Had Carson lived long enough to write the book she contemplated about rising seas and changing climate, might it have landed in bookstores at the right time, with the right imagery to dig deep into people's minds and hearts? By the time global warming finally gained widespread attention, 25 years later during that overheated, drought-stricken summer of 1988, regulatory successes had already cleaned up the most viscerally irritating pollutants. Gone were the burning river and the sulfurous clouds of purple and pink that swept like midday sunsets over urban areas in Carson's time, and gone with them were the gut-wrenching imagery and noxious smells to sustain broad-based outrage. With her science and prescience, carbon dioxide might not have slipped through the regulatory shield that rose to spare the living while leaving the future unprotected. In this time, when women, diverse shades of race and gender, and now youth, are finding their voices, nature remains forever mute, requiring our empathy, humility, and keen observation to discern its needs and our utter dependence upon it. Carson spoke up for this most creative, most giving, and most abused entity. She found the words to make the earth shake and sing within us.